After a confirming Ultra Sound, they sat down with their kids and told them about Braden’s trisomy 18. Over the next few days they told friends and slowly the word got around to other church members and friends. By the time Braden was born, everyone knew that his life would most likely be very short, but very special. One of the things Bruce and Bonnie did as they prepared for his birth was decide that they wanted comfort care for Braden. At 29 weeks Bonnie ended up with high blood pressure. She was placed on modified bed rest and was also found to have protein in her urine. For a month she endured the bed rest along with a lot of 24 hr urine collections, blood work and blood pressure checks. She was also hospitalized several times where they kept her for a few hrs at a time on the OB floor to monitor her blood pressure. 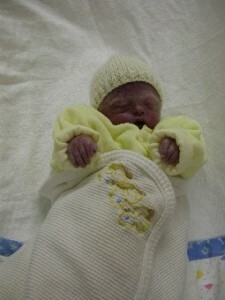 She had a routine OB visit scheduled at 34 weeks and hadn’t felt much movement for a few days. When they took her blood pressure in the office and it was once again sky high they put her on the monitor to check the baby’s heart rate. His heart rate was in the 120 to 130 range and then dropped down to the 60’s. The doctor took one look at her blood pressure and the baby’s heart rate and said “We have to get you delivered”. He also added that if this were a normal healthy baby they would be doing an emergency c-section right away. Bonnie was then sent to the OB floor and was induced. After being in labor for a little over 5 hours they could no longer detect a heart beat. After a confirming ultrasound she continued to labor for another hour and a half. She had an epidural and was so thankful for it. 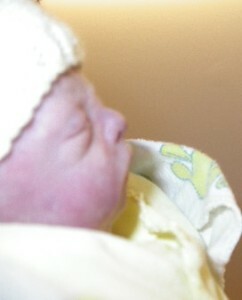 Bonnie recalls, “I delivered our sweet angel Braden with just 2 pushes. He weighed 3lbs. 6.6 oz. and was 15.5 inches long. A head full of blonde hair and just BEAUTIFUL!! 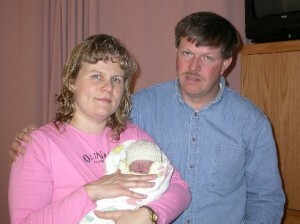 “The moment Braden was born my thoughts were “Wow, is he ever small”. I had never had a baby that small. He was placed in my arms and oh the love we had for him. He was so peaceful. We spent 3 days at the hospital with our little sweetheart just loving him, holding him, kissing him, rocking him and sharing him with lots of family. The nursing staff was so good and made us plaster hand and foot molds, cut a lock of hair for us and took lots of pictures for us. We also took a lot and videotaped too. 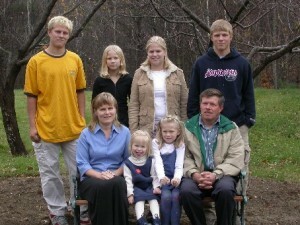 “My children were so natural with Braden. They would hold him and rock him and kiss him and even when he had a little nasal discharge they would just tell me he needed his nose wiped and they’d use a Kleenex and just hold on to it as if it wasn’t any big deal to them. The support and prayers from her family, friends, and church family have been invaluable to her. Due to the harsh winter weather, Braden could not be buried for 4 months. He is buried only 5 minutes away from their home, and his stone was placed right after his burial. They have started a memorial garden for Braden in their yard called, “Braden’s Garden”, which has provided some comfort to the whole family. Bonnie has found many things meaningful to her in her healing process. Several songs have become very special to her. Her 14 year old daughter Sierra sang “Sleep Sound in Jesus” by Michael Card at the funeral. A friend gave her a Twila Paris CD with the song “Visitor from Heaven” on it. Also “A Christian’s Goodnight” was sung at the funeral by a friend. God gave a son, so lovely and fair, blue were his eyes, spun gold was his hair. A small bundle of joy, more precious than gold. Yes, God gave us an angel, we could love but not hold. He took him to heaven to be with him there, but all of the heartaches he helps us to share. At times we feel lonely and sometimes we weep, for the littlest angel, we could love but not keep. All through the heartaches and all through the pain, we thank God for his kindness, his blessings our gain. For one day in heaven, in our new home, we are told, He will give us our angel, to love and to hold. She also found several books meaningful, among them: “Empty Cradle Broken Heart”, by Deborah Davis, “Misty” by Carol Gift Page, and “When Christ Comes” by Max Lucado especially Chapter 5. 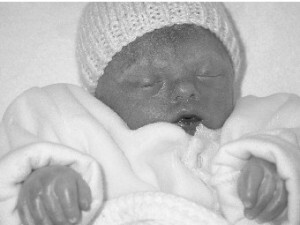 Bonnie writes, “During my pregnancy I thought it would just be easier if I just lost him early on to miscarriage. I also thought that with all his problems I was afraid of what he might look like and I had the mother protective feelings thinking that I maybe wouldn’t want anyone else except immediate family to see him. When Braden was born I felt such a love and compassion for him; I KNOW it wouldn’t have mattered if he had looked worse, I would have still loved him just the same. He was so beautiful, though, and we shared him with many.